One-click access to leading EHS webinars to advance your career and provide critical compliance and management guidance. 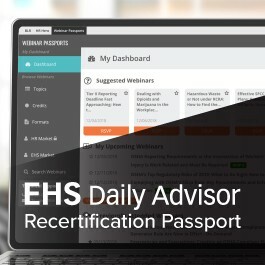 Busy environmental and safety professionals can take advantage of an all-access full-year pass to EHS Daily Advisor’s full portfolio of webinars—including must-attend recertification-eligible programs on your top compliance challenges. Federal agencies are still on the prowl for non-compliance and the penalties and stakes are at an all-time high. Learn how to limit your liability and protect your workforce with these timely training programs! How do I earn recertification credit for attending webinars within the Webinar Passport portal? Upon attending a live webinar you will be prompted to take an evaluation at the end. Once you’ve completed the evaluation form, you will receive your credit certificate or a general certificate of attendance that you can then upload into your attended webinars on the Webinar Passports portal to track your credits. Users will still need to submit their credit information to the appropriate accrediting body in order to validate their recertification credits. I didn’t receive an email alert with access instructions. What should I do? If you did not receive an email with your access instructions, check your junk or spam folder. 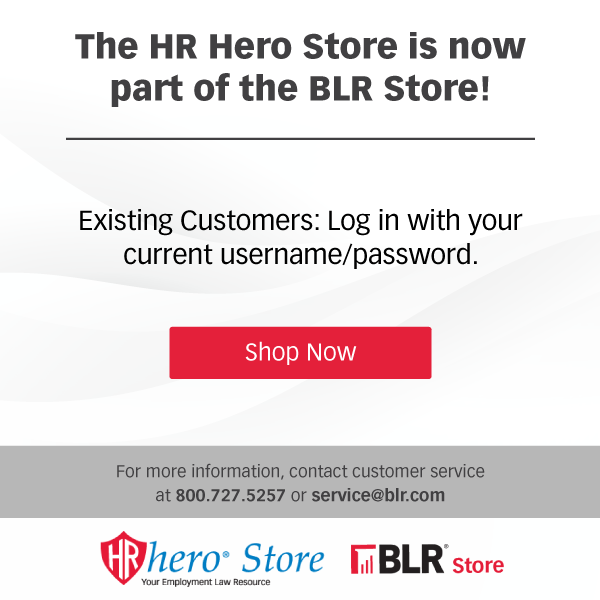 To ensure future delivery, whitelist service@BLR.com . If you are still experiencing issues, please contact Tech Support by phone at 844-687-0479 or email at techsupport@blr.com . How do I receive on-demand access after a program has aired? Simply log into the Webinar Passport poral, click on Search Webinars within the menu on the left-hand side of the page, enter a keyword that matches your desired webinar, click the webinar you are interested in watching, and click Watch. Can I receive recertification credit for on-demand programs? For HRCI credits, approval is valid within the calendar year of the program’s air date. Please see credit information in the program description to confirm eligibility. What do I do if I forgot my username and/or password to Webinar Passport, or I need my password reset? If you need to have any username or password related questions or issues, please contact Tech Support by phone at 844-687-0479 or email at techsupport@blr.com. If I have a team of users, what is the best way to provide them access? If you need additional users added to Webinar Passports, please contact Tech Support by phone at 844-687-0479 or email at techsupport@blr.com. Where can I see the webinars I added to my Favorites? Throughout Webinar Passports, you will see a star next to each webinar. All webinars that you indicated as a favorite webinar, will have a solid gray or yellow star. To view all your favorite webinars, click Search Webinars on the left-hand menu, and select Favorites within the ‘Filter by Favorites’ drop down. I RSVP’d for a webinar and now I an unable to attend. What should I do? If you are unable to attend a webinar, simply click the webinar title to enter the webinar details page and click the green RSVP’s button. After confirming that you are unable to attend the webinar, the RSVP button will turn red and your RSVP will be reversed.